Venezuelan president Nicolas Maduro was speaking at an event in the Capital, Caracas, to commemorate 81st anniversary of the Venezuelan National Guard on Saturday. When what seems like an assassination attempt was made. He looked up during his speech as a drone was coming towards him and Cilia Flores, his wife who was sitting beside him cringed when she heard a loud sound. Several members of the National Guard were hurt as they scattered. However Maduro was not hurt and he believes far right elements and the Columbian outgoing President Juan Manuel Santos could be responsible, but Columbian sources have denied the accusation, they say they are baseless. 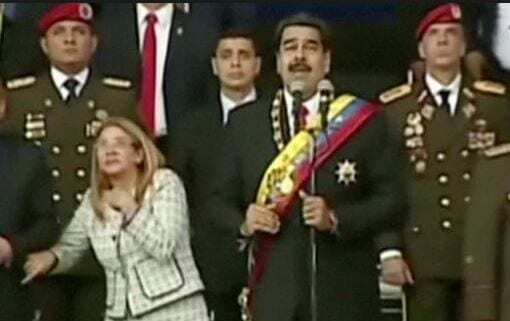 Maduro has said he thought he was hearing fireworks as a part of the military celebration, but somehow he didn’t get hurt. The President has a lot of enemies as there is a lot of unrest in Venezuela, so it will take some investigation to find out who did it.